Solutions designed specifically for professional services firms advising on corporate governance, executive compensation, and sustainability matters. ExecComp Analytics (ECA) offers unmatched data, analytics, and access to a variety of online benchmarking tools. Consulting and advisory firms leverage ECA to benchmark and plan using the same dataset used by many of their clients’ leading investors. Leverage ICS’ Pay-for-Performance Modeler using ISS projected peers with basic platform support and training all year long. ECA subscriptions also include ICS Advisory’s highly sought-after ExecComp reports detailing the latest data and industry trends each quarter. ECA offers unparalleled breadth of data, including proprietary data points used in ISS analysis. A toolkit designed especially for consultants, attorneys, and other outside advisors who want to provide a comprehensive pay governance solution to their clients. ECA+ is offered with year-round access and is licensed on a per-company basis with shared access so outside advisors can utilize the tools on their client’s behalf. If your firm has in place a referral agreement with ICS and you request a subscription for any of your clients, we can invoice either your firm or the client, depending on your preference. Use ECA Plus to build peer groups, analyze compensation trends, and conduct pay-for-performance modeling for your clients. As a consultant, if your client has access to ECS, you can share access to all the online components of this suite. Extensive knowledge repository and database of publications, research articles, online reports, and ISS’ Global Proxy Voting Manuals. Content is searchable by subject matter and keyword to expedite the professional services firm search process. Stay in the know with Governance Insights, our weekly flagship editorial featuring news and analysis of corporate governance developments, including insights and reporting found in no other media. ISS sets the standard in data collection with the number data points available for custom feeds via API, web service, and other dissemination methods. Contact us for a brief discussion and to browse our extensive data dictionary. Voting Analytics is the largest proxy voting database worldwide with over 100 million data records. A user license includes real-time access to company voting results within hours or days of disclosure based upon the global market. Advisors can benchmark proposal success rates, assess voting trends, and obtain strategic insight on institutional investors or proposal outcomes. Gain insight into ISS’ rigorously formulated voting policy, reflecting institutional investors’ perspectives. Proxy research reports offer unparalleled expertise in mergers & acquisitions (M&A), pay-for-performance and overall corporate governance analysis. Obtain objective proxy research for specific companies or proposals types and review agendas for pending and historical shareholder meetings for companies or their peers. 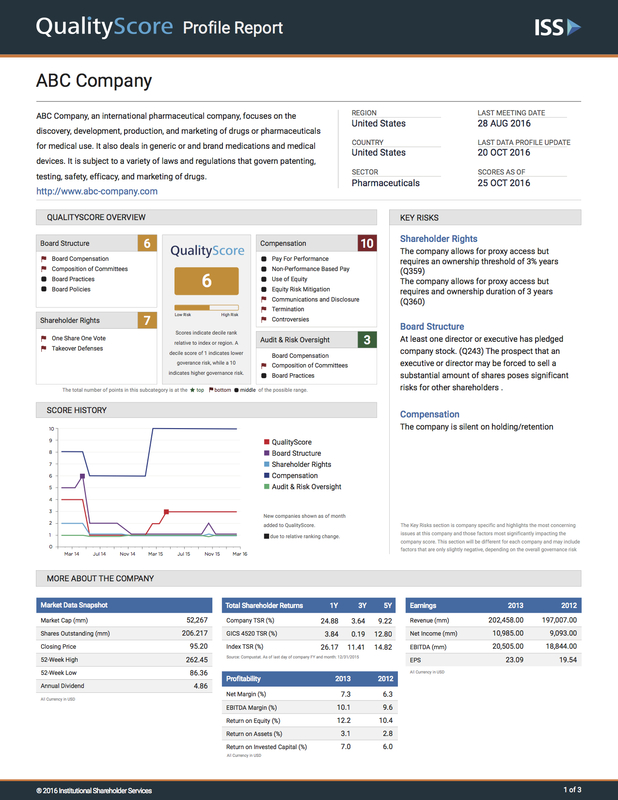 ISS Governance QualityScore Profiles provide a detailed analysis of a company’s ISS Governance QualityScore, and a list of the factors that influenced the score both positively and negatively. 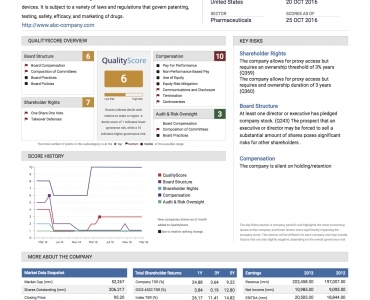 QualityScore profiles include an overall decile ranking, based upon the ratings of four key pillars: Board Structure, Shareholder Rights, Compensation, and Audit & Risk Oversight. ISS Special Situations Research provides coverage of mergers & acquisitions as well as economic proposals that investors may encounter, including proxy contests, and the investment implications of emerging trends in corporate governance such as bylaws restricting governance rights or investor recourse. ISS sets the standard in data collection, with thousands of data fields available for custom feeds via API, web service, and other dissemination methods. Contact us for a brief discussion and to browse our extensive data dictionary.